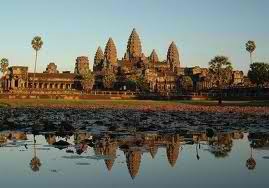 Angkor Wat, a temple complex at Angkor in Cambodia, is a Runner-up for the New Wonders of the World. It served first as a Hindu temple dedicated to the god Vishnu, then as a Buddist temple. Built in the Khmer style, it is the world’s largest religious building. It is located three miles north of Siem Reap and near the old capital of Baphuon. Angkor Wat which means “City Temple” was built for the King Suryavarman II in the early 12th century as his state temple and capital city. In 1177, Angkor was sacked by the Chams, the traditional enemies of the Khmer. The new king, Jayavarman VII, built a new capital and state temple to the north. Henri Mouhot introduced the temple to the West in the mid 19th-century. Restorations were begun in the 1980s and the site has become a popular tourist attraction.